Stormwater runoff from construction activities can have a significant impact on water quality. As stormwater flows over a construction site, it can pick up pollutants such as sediment, debris, and chemicals and transport these to a nearby storm sewer system or directly to a river, lake, or coastal water. Polluted stormwater runoff can harm or kill fish and other wildlife. Sedimentation can destroy aquatic habitat, and high volumes of runoff can cause stream bank erosion. Debris can clog waterways and potentially reach the ocean where it can kill marine wildlife and impact habitat. 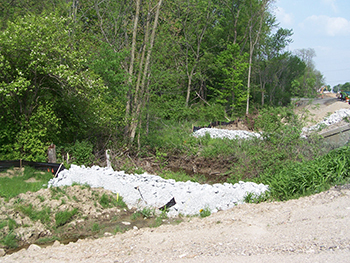 The National Pollutant Discharge Elimination System (NPDES) stormwater program in Indiana requires construction site operators engaged in clearing, grading, and excavating activities that disturb one acre or more - including smaller sites in a larger common plan of development (i.e. subdivision) or sale - to obtain coverage under an NPDES permit for their stormwater discharges. Indiana implements the stormwater NPDES permitting program under the Rule 327 IAC 15-5 Construction/Land Disturbance Stormwater Permitting, commonly referred to as Rule 5. In Indiana, most construction projects subject to Rule 5 are administered through a general permit, which is a permit by rule, and as such it is not issued in the same manner as an individual NPDES permit would be issued. The permit conditions within Rule 5 apply universally to all project site owners who are eligible to operate under the rule. Therefore, the application for a Rule 5 general permit is called a Notice of Intent, or NOI, because the applicant or project site owner is essentially notifying IDEM of his or her intent to operate the proposed construction project in a manner consistent with the Rule. The applicant must follow all guidelines and requirements for submittal of the general permit, which includes the submittal of a Construction Plan and a Notice of Intent. Prior to submittal, the applicant must send the Construction Plan to the county Soil and Water Conservation District or the local Municipal Separate Storm Sewer System for approval. The Notice of Intent must include the fee, notice of publication, and verification from the review authority that the plans meet the requirements of the Rule. If an adverse environmental impact from a project site is evident, a Rule 5 permit, or in more significant situations, an individual stormwater permit may be required. An individual stormwater permit is typically required only if IDEM determines the discharge will significantly lower water quality. If an individual stormwater permit is required, notice will be given to the project site owner. The Individual Stormwater Permit has its own set of application requirements. While permits are not the most exciting item on your project To Do List, don’t forget the paperwork! Sediment is one of the most common pollutants associated with water pollution. The practices implemented as part of a Stormwater Construction Permit are important in preventing the depletion of topsoil and degradation of water quality.